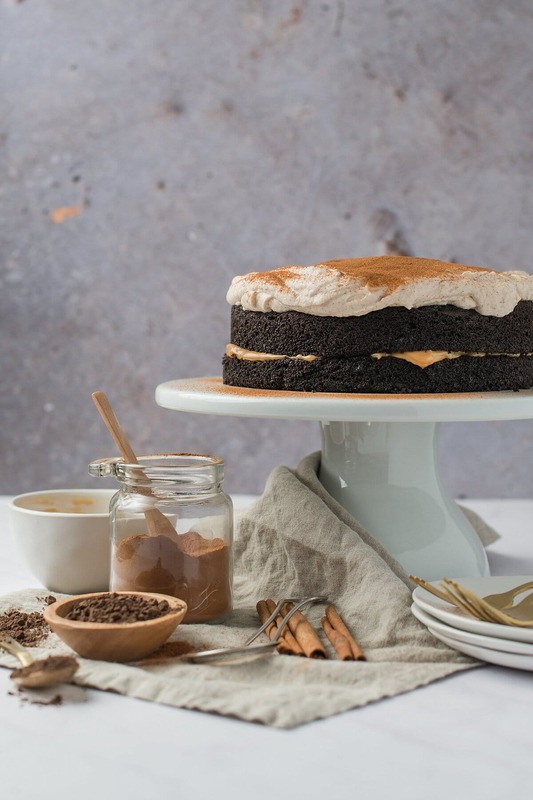 Mexican Chocolate Cake with Mascarpone Frosting // A deep and dark chocolate cake with just a touch of heat. Topped with cinnamon mascarpone frosting. Edited April 2019 // This recipe was long overdue for an update. I didn’t change a thing about the recipe, it’s perfect as is. This cake has been sitting in my archives for years and one I make time and time again. On occasion, I’ll add a layer of dulce de leche in between a layer that I’ve cut in half. Try it. You won’t regret it. When people find out that you have a food blog, they start making requests. Sometimes, the requests are things that I would not normally want to make or eat. I flipped through this recipe in the Thanksgiving issue of Sunset and did not look twice at it. A friend of my husband’s mentioned that he would love it if I made it for him, and since I love to make people’s baked good dreams come true, I happily obliged. I read the recipe and thought that it had the potential to be absolutely amazing, or a complete bomb. I am happy to say that it is in fact amazing. 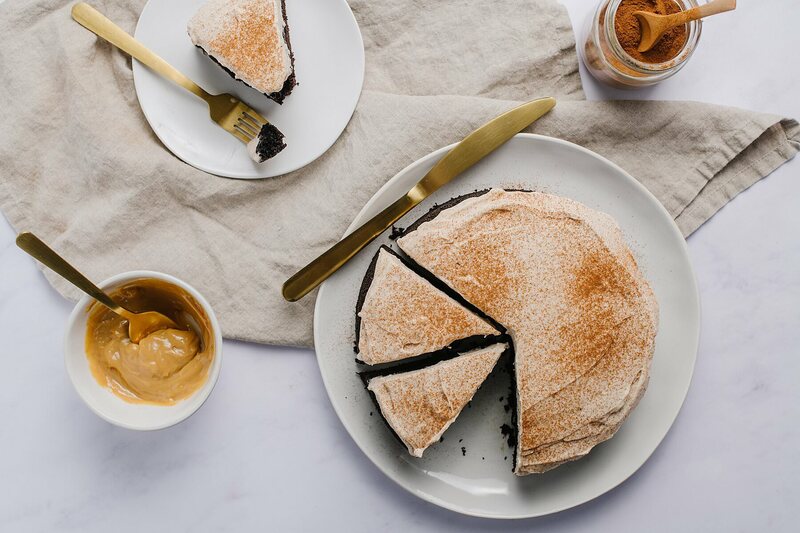 The balsamic vinegar, cayenne pepper, and cinnamon are not at all overpowering and just bring out the deep, dark chocolate flavor of the cake. This cake also could not be any simpler to make. I made it by hand, and it took no time at all. The recipe called for a cinnamon ice cream, but I had a transport problem. I did not want to make homemade cinnamon ice cream and have it not make it to its final destination frozen. So instead, I made a cinnamon mascarpone frosting to go on top. The frosting is rich and not overly sweet. It is the perfect compliment to the complex flavors in the cake. This recipe makes 2 (8-inch) frosted cakes. 1 cup unsweetened black cocoa – You can use regular, but I love black for this recipe. 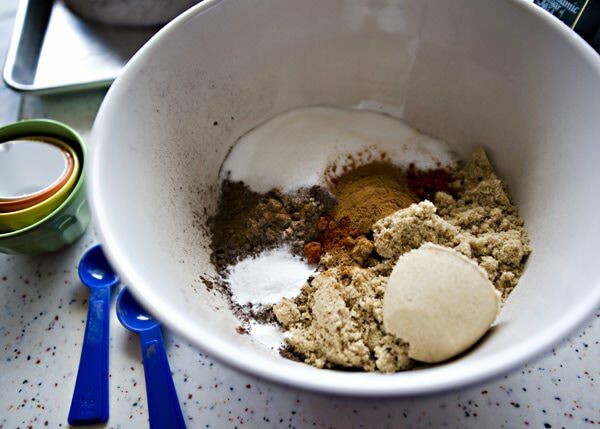 Put all of the dry ingredients in a large bowl. It helps when you remember the flour. Duh. Add all of the liquid ingredients. Mix until smooth. How gorgeous is this batter? It is almost black. Yum. Spray two 8-inch pans with cooking spray. Put a piece of parchment on the bottom of the pan and spray again. 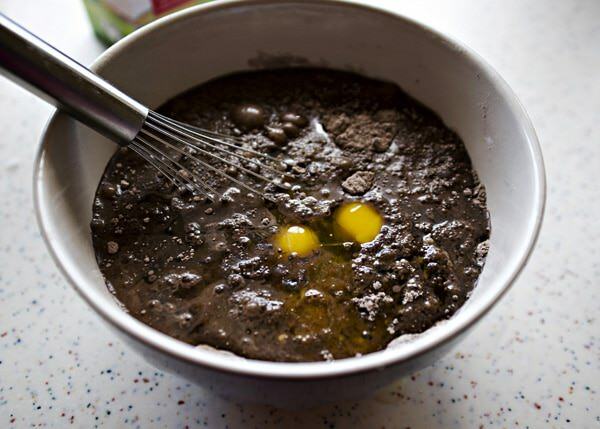 Pour the batter into the cake pans. Bake in a preheated 350-degree oven for about 45 minutes, or until a toothpick comes out clean. Let the cakes cool in the pans for 10 minutes. Turn them out and let cool completely. Whip the heavy cream until stiff peaks form. 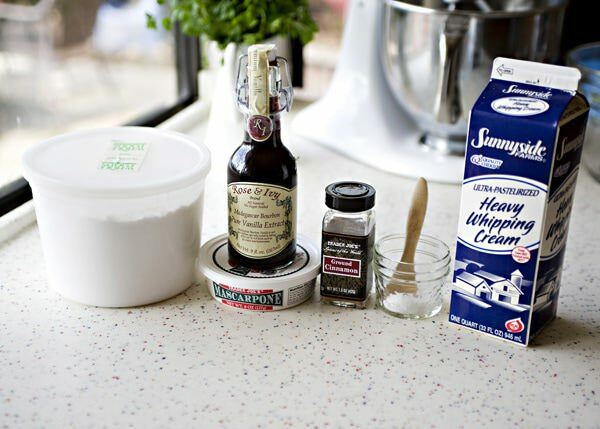 In another bowl, whisk together the mascarpone, cinnamon, vanilla, salt, and sugar. Gently fold the whipped cream into the cheese mixture. Use half of the frosting and cover the top of your cake. Sprinkle cinnamon on top for garnish. This cake is moist, flavorful, and delicious. A perfect ending for a Mexican feast or something to bring to a Cinco de Mayo party. One of my best tips EVER! To get even and flat cakes, take two strips of old towel and wet them. 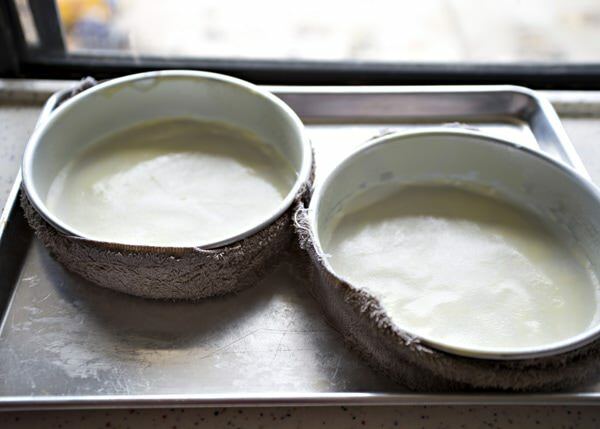 Wrap them around the outside of the cake pans and bake. Your cakes will come out completely level and you will not burn your house down. I did not believe it until I saw it for myself. You can also buy cake strips, but this works just as well. Black cocoa my preferred cocoa for this recipe. You can find it in the regular old grocery store. Hershey’s makes a dark powder. It makes a deep and dark cake that is exactly what you want. This cake makes TWO 8-inch layers. I do not stack them and make a layer cake. The frosting is light like a whipped cream and not stable enough to hold your cake together. Just make two separate cakes. The mascarpone cinnamon frosting is incredible but made with heavy cream so this cake needs to be kept in the fridge before and after serving. 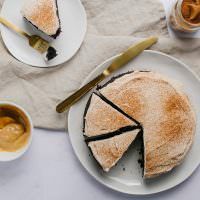 Mexican Chocolate Cake with Mascarpone Frosting – a rich deep chocolate cake with a little kick and topped with a whipped cinnamon mascarpone frosting that tastes like just horchata. Make the frosting. Whip the heavy cream until stiff peaks form. 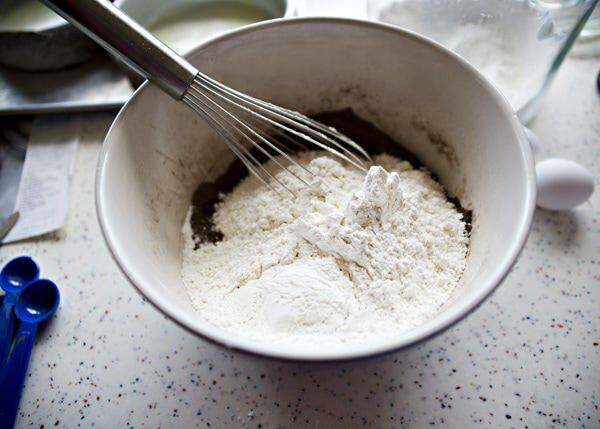 In another bowl, whisk together the mascarpone, cinnamon, vanilla, salt, and sugar. Gently fold the whipped cream into the cheese mixture. Use half of the frosting and cover the top of your cake. Repeat with the other layer. This cake makes 2 8-inch layers. I don’t stack them because the frosting is soft, and doesn’t give enough structure. I make two separate cakes instead. 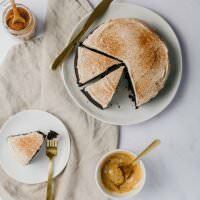 Goodness this looks sublime…chocolate and cayenne!? And mascarpone? Sounds strange but looks divine! Just found this recipe and it is intriguing….I’m going to try it out today. One question, I want to make the cake the night before and hold it over for the next day….How does the frosting hold up in the refrigerator? I am not sure, I ate mine the day that I made it. The cake itself will be fine, but I would probably make and ice the day of. But it should be fine for a day. I made this cake, but since my family was not able to eat the whole thing in one night we left it out for a while, just on the counter with a cover, and it stayed good for a couple days before we finished it. I’m glad that they liked it. I think I would love love love this! Rich & chocolatey, but not too sweet. The hint of cinnamon & cayenne sound amazing with chocolate & marscapone. Mmm…. I was shocked at how good this was. The frosting makes it. Not too sweet. I’ve been folowing your blog in my google reader for some time now. I must say I love it. All your recipes look so tasteful. Your photos are great, too. 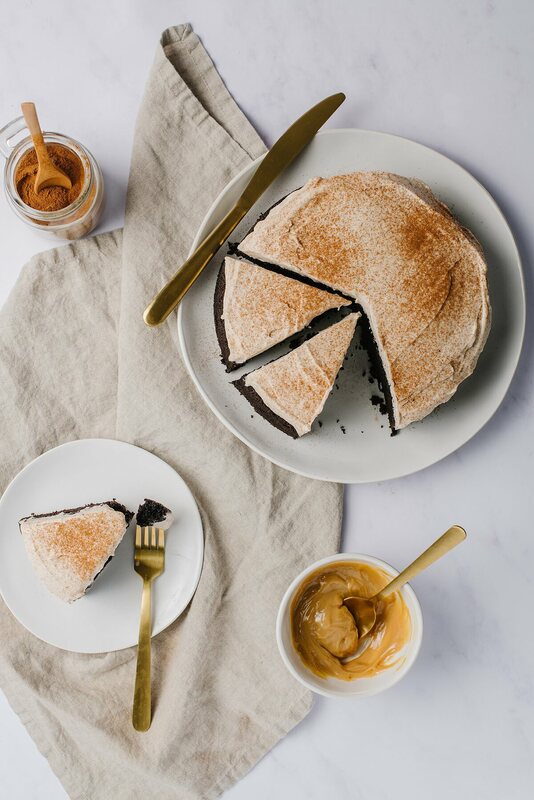 This Mexican Chocolate cake is definetely on my list of recipes to try this year. I could spend all day here on your blog!! 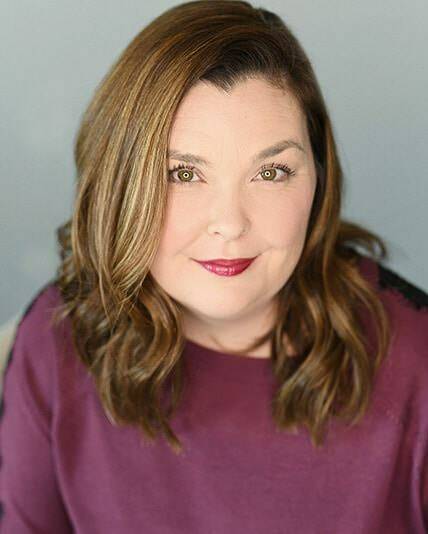 Thanks for sharing on Wendy’s blog!! Thanks for the encouragement on this recipe! I would seen the ingredients and kept going (if I am going to bake I want to give myself a good chance that it will be yummy!) but your comments have me reconsidering. I agree that baking for friends is the best! I would have passed over it too, but I am really glad that I didn’t. Wow….It’s looking so yummy!! I can’t control water of my mouth. I was shocked at how good it was. I’m gonna have to try that tip for making cakes level! Thanks! Oh, wow– this looks so good. 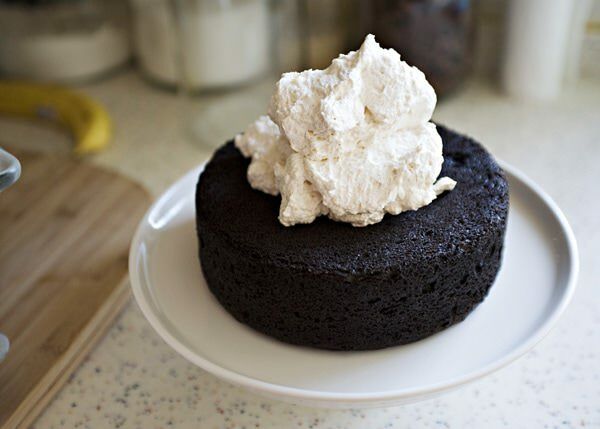 I love how dark the cake is and frosting looks sinfully good! this cake was a surprise. It was so delicious. This looks so good. Hmmm, who can I make it for? That cake is absolutely gorgeous! We’d love if you could enter it into the Recipe4Living 5th Birthday Contest! You could win a huge gift basket full of Scharffen Berger gourmet chocolate! the frosting is perfect with this cake, but honestly, this cake can stand on its own. It is rich and amazing. I made this cake this week for my book club and it was awesome! The towels really do keep the cake flat, so I was glad I went out on a limb and tried it. If you only want one cake (because it makes a lot! ), I recommend either cutting the recipe in half or making two and freezing the other. This cake is super moist and so easy to make. 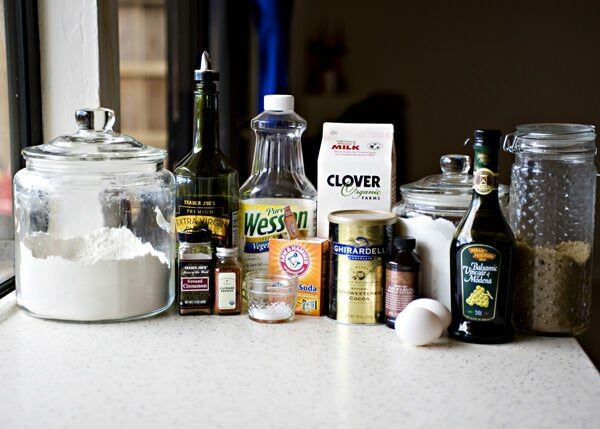 I am thinking the cake recipe it self is a great base for a cake and you could switch out spices as you wished. I’d really like to try it with Orange or lemon zest in stead of the pepper and cinnamon sometime. I think this would also work with the icing, adding the spices or flavorings that go best with your cake. Now one of my favorite recipes! Isn’t that the coolest trick ever? I think that the next time I make it, I will save the other cake to make a trifle. I love this cake, perfect for a Mexican dinner. PS – found you on foodgawker. Great cake! I teach Spanish and made this recipe for my Spanish students for today’s Cinco de Mayo celebration. They loved it!!!! I’ll make this again for our friends and family! that is great! Thanks for letting me know. Sounds really interesting! I think I’ll make it for a party tomorrow and then have the leftover one for Mother’s Day!! Great idea! I love that cake I hope that you like it too. glad that you like it Natalie! I baked my cake for 40 mins and it was over baked. 🙁 I think 35 minutes would have been perfect. I really like this cake. It’s deceivingly light cause of the frosting. I didn’t use all of the whipped cream though. I used about 3/4 of it and it was just the right amount. Make sure you use the darkest cocoa you can find. I just used the Hershey’s natural cocoa and it didn’t come out as dark as yours. I love this cake, the frosting is perfect for it, and I love the flavors. I use expensive cocoa always, usually Guittard, it probably does make a difference in this recipe. This was a total disaster. The batter tasted great and the cakes tasted good, but using 8.5 inch pans, they both spilled over in my oven. It sounds like your pans were too small. How full did you fill them? 8.5 inch filled halfway, like I usually do. Your pan is too small, use a 9 or 10 inch. You used the 8-inch and it worked out? I made it a long time ago, but I am sure that had leftover batter. Do you think this recipe would work for cupcakes? Or is the cake too dense? Thanks! I think that it would be a great cupcake. Give it a whirl. Oh my GOD this was so good!!!! This was the finishing touch to my first Mexican meal that I made to celebrate my husband’s birthday and it was absolute perfection. Probably the first time in six months I’ve been able to refrain from meddling with a recipe and I’m so glad I followed it to the letter ( although I’m so tempted to try adding orange zest next time). Definitely will be making again! Welcome Jess! I am glad that you liked it. Orange zest would be good in this. Thanks for the idea. Just made this FABULOUS cake recipe for my Day of the Dead dinner party – I made cupcakes instead of cakes. Thank you so much! It works as a cupcake? Good to know! I’m going to bake this next week for a Sint Nicholas party with my friends (Dutchies rock ;)) and I’m excited to try it. I think I will post some photos on my blog (which is in Dutch though) and let you now how it was! I am so glad. I love this cake, different, but delicious. 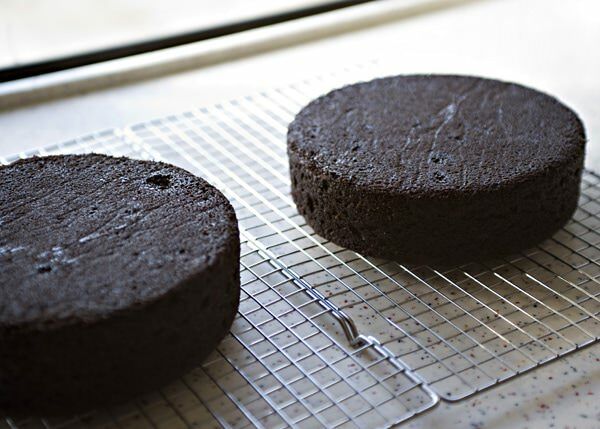 Sure, just slice the cake into layers after it is baked, or bake it in two separate pans. You will have to alter the baking time. Yes it can. I use a very high quality dark cocoa powder. Made this cake yesterday. Frosting is amazing. But can’t figure out why the cake was a bit “dry”. Not as moist as I thought it would be considering the oil. My guess is that is was over baked. There should be a little crumb still on your toothpick when you take the cake out of the oven, it will continue to cook when it comes out. Going to give this another try this week. I have to make a larger cake, so am going to double recipe and bake it in an 11 x 14 pan. Since your single recipe makes nice high layers in the 8in pans I think I’ll be able to get 2 nice layers out of the double recipe. Do you agree? BTW I am new to your website, but I love it. Count me as another fan!! 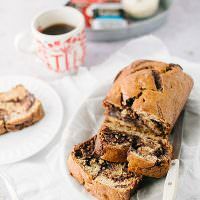 If I use dutch process cocoa in this recipe, should I leave out the baking soda? Will the balsamic vinegar be sufficient to act as the acid needed when replacing natural cocoa with Dutch Process? I really am not sure Jack, I didn’t use dutch process, so I cannot tell you for sure. Made this yesterday for a birthday party. It was a huge hit and I will definitely make it again! I am so glad Nicole. I love this cake, I like to make it for Cinco de Mayo. I’m really interested in making this for a Mexican-themed party this weekend–it looks truly fantastic! I’ve never heard of Mascarpone cheese before, is it similar to cream cheese? Sort of. It is in the fancy cheese section. Sorry for this stupid question. When you say cup, you mean 2 dl=0.2 l? Or 0.25dl? I am not sure exactly, but this is what I found. The volume of 1 cup = 16 tablespoons = 1/ pint = 0.2365882368 liters. A deciliter (dL) is 1/10 or 0.1 of a liter. So, 1 cup is 2.365882368 deciliters (volume). Uau. Thank you so much. I am going to do it in a few minutes. For my girlfriend, it’s 8. March. Just to clarify, when you made this you ended up with two single layer cakes, each covered in 1/2 the frosting? Or did you stack the two cake layers, without frosting in between, and frost the top layer only. I had two separate cakes, and split the frosting in half. I am so glad! This is a really good cake, I am glad that you liked it so much. Just a few questions, when you say vanilla, do you mean vanilla extract/sugar? 350 degrees, do you mean Fahrenheit? And these cups are still confusing me…so one cope would be a half point, is that right? What is a half point? There are cup conversion calculators all over the Internet, it is how I do a conversion if I need to. Yup, unless I state otherwise, it is always all-purpose. It is a dense cake. It has baking soda, so it should have risen. Maybe a silly question but I’m making your tiramisu cake tomorrow for one of our Christmas Eve desserts and I want to try your towel trick. How do you get the towels to stay on? I’ll dampen them but then do you somehow attach them together where they meet? They usually stick since they are wet, but you can tie them in a knot. I made this cake last night for my step-mothers birthday. She LOVES the spicy chocolate ice cream a cousin of mine makes, so when I came across this recipe I knew I had to make this for her. She loved it and so did everyone else! Thanks so much for sharing this great recipe! I so glad that she liked it. i was wondering how you think this would be if i made it as cupcakes? I’d give it a try and see. I made this recipe as cupcakes and a mini cake and they were amazing! Thanks so much for the recipe!! What adjustments did you make for the cupcakes? I’ve never made them into cupcakes, but I wouldn’t make any. Aaaaamazing cake! It tastes great even two days after. So moist and rich. I love this cake, I haven’t made it in a long time, I need to. Oh yeah, that looks like a seriously moist cake. And this is a perfect recipe for Cinco de mayo with the mexican chocolate touch! It is a perfect recipe for Cinco de Mayo! Bree. This. Looks. Amazing. Mascarpone makes everything better–even chocolate! I must try this as soon as possible. I’m so glad I found your blog! This looks so delicious but I’m allergic to cinnamon. Would it drastically change the cake(flavor) if I omitted the cinnamon? This looks so good but I’m allergic to cinnamon:( Would the recipie still work without it? It will work, but the cinnamon is what makes is Mexican. 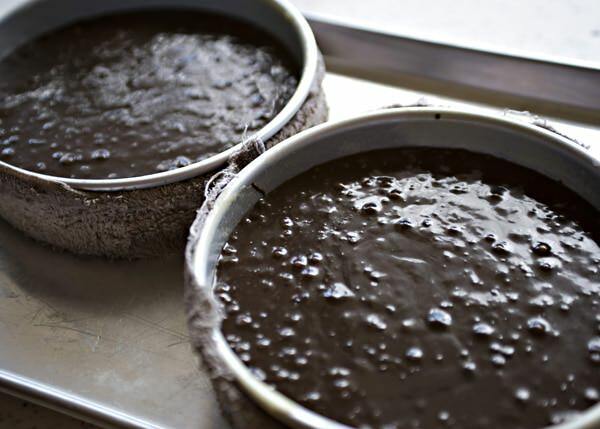 Would using two 8X8 inch square cake pans use the same amount of cook time? I am not sure that you will have enough batter for 2 8×8 pans. And I am not sure about bake time. Are you putting the two cakes on top of each other or are you frosting each one? I thought I might try frosting between and make it double layer cake. I frost each one separately. 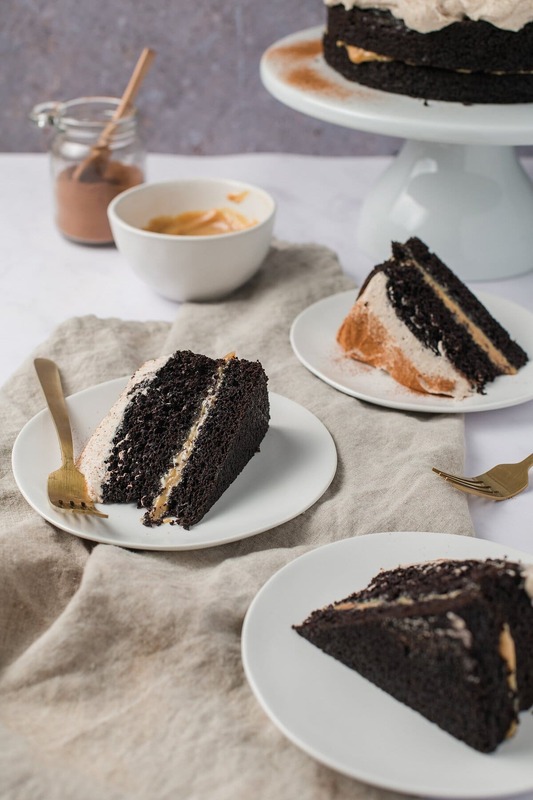 Did you end up trying the double layer cake? I’m wondering how the softer frosting would hold up between the layers. I did not, but I would make a cinnamon scented cream cheese frosting for that. I’ve made this cake three times now in a double layer and have had no problems using the frosting from this recipe in between layers. Just make sure it is completely cooled. I add some sugared strawberries to the center and fresh ones on top and it is heavenly! Awesome! I love this cake too, I haven’t made it in a long time. I need to. Thank you! I love this cake too. I’m planning on taking this to a party where there will be NO refrigerator space–will the mascarpone frosting hold up okay without being refrigerated? Use your best judgement, but it is cream. Oh my goodness I’m baking this right now and it smells amaaaaazing! Also the frosting is to die for,thanks!! Are the pans 8×2 or 8×1 1/2″? Made this a little while ago: unbelievable texture (soft as a box cake and even moister) with a fantastic zippy cinnamon/chili kick. Didn’t have cayenne, used Tabasco sauce: YUM. Most Mexican chocolate things I’ve had just have a slight cinnamon overtone: this was actually a little spicy! And the mascarpone PERFECT! Not too sweet…. When I needed a reliable chocolate cake as the base of a trifle, I just used this recipe without the cinnamon/tabasco and it was perfect. I am so glad that you like this cake so much! I do too. Great idea to use it as a trifle. Help!!!! Is this suppose to be thick like brownies? Can I layer with frosting in middle? I wondered the same thing. Baked in two pans but no mention of frosting in the middle. Did she make 2 single layer cakes? From reading previous comments, looks like this makes two single layer cakes. Some also made cupcakes. Also stated to fill the pans 1/2 way. May have leftover batter for 8″ pans. She recommended larger pans for all the batter. I made one cake, no layers, but you can bake it however you want. I just want to thank you for posting this recipe. This is the cake my boyfriend always requests for his birthday, which is conveniently close to Cinco de Mayo. The mascarpone cream frosting is divine! I add fresh strawberries to the top which work really well with the flavors. The strawberries would be perfect on this. I am so glad that you like it so much. I just made this yesterday for a Cinco de Mayo party and it was such a hit! It was one of the best chocolate cakes I have ever tasted. Very different but oh-so-good. Will definitely be making this again 🙂 The kick from the pepper was incredible. This cake looks amazing! Quick question: did you use cake flour or AP flour! I’m excited to try this cake! I’m curious about the towels though, wouldn’t that be a fire hazard? No, they do not burn. That’s why you get them completely wet first. Also, is the mascarpone frosting pipable?? I’m making this cake tomorrow, and I’d like to know if I could pipe it without any trouble. Thanks, and I love your blog! Did you end up trying to pipe it? I’d like to try it, too. Yes, I did, and it pipes like a dream! 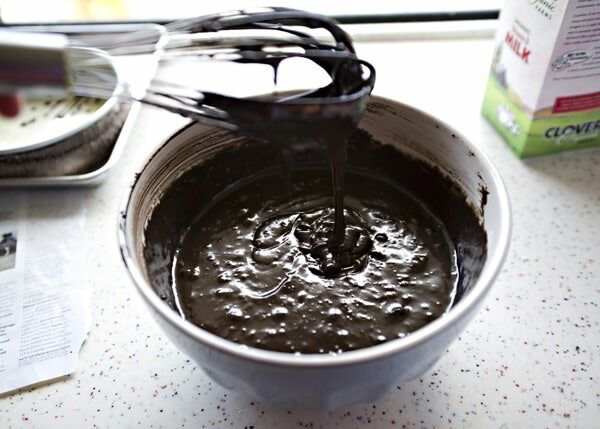 What cocoa powder did you use to make the cakes so gorgeously dark? I don’t remember exactly, but any dark cocoa will do it. I like Guittard or King Arthur. I only had 9″ pans so the time on those was 35 minutes. Made the frosting and refrigerated it, frosted just before serving as a layer cake and it worked out great. It’s still holding up in the fridge 2 days later. 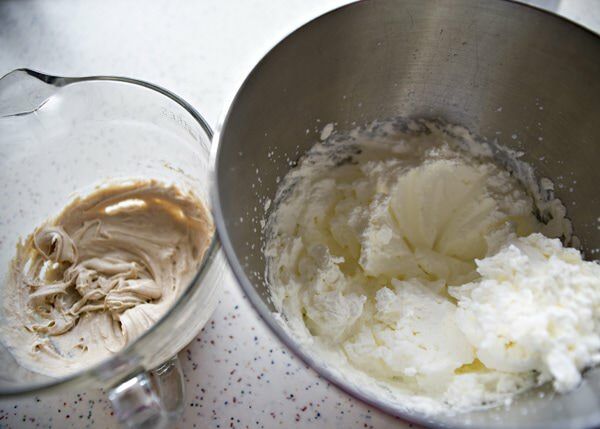 Easiest way to make the frosting was to whip the cream to just under in a mixer, set aside, whip the other ingredients, add the cream back and finish. My layers came out pretty level without the towel trick. I used very little cayenne as I was serving to a spice averse crowd and the cake was still fantastic. All in all, a winner of a recipe. I’ll be sharing on my blog sometime soon. Thanks for sharing! I’m glad that you liked it so much. It’s a great recipe and just a little bit different. What type of Guittard cocoa did you use? I can only find Rouge which is dutch cocoa. Any other cocoa suggestions? There is a picture of what I used. Ghiradelli cocoa. Great cake and easy to make. I used 9 inch round pans. I was able to get the extremely dark color by using Hershey’s Special Dark cocoa. You can use Dutch-processed cocoa like the Special Dark Hershey’s in this recipe because it has vinegar in it. I would also note that I did not pack the brown sugar because we do not like our cakes too sweet. I’m glad that you liked it so much. Thanks for the review. My daughter made this for her wedding 3 years ago. It was so good, she then made it for her brother’s wedding a couple months later and another brother’s wedding 2 years later. It seems to be a wedding tradition in our family now. You can see some photos of it on my website. This is THE BEST cake–ever. I’ve used it for 2 years. If I’m not doing mexican chocolate, I will omit the mexican ingredients and it still turns out TO DIE FOR. Thanks Bree! I am so glad, it is a good cake. Do you think this could be done in a bundt cake pan – a 12 inch? I used this recipe for my wedding cake, it was so good!! Thank you for an amazing recipe it is delicious!! Amazing! I’m so glad that you liked it. Yes. It is very moist.